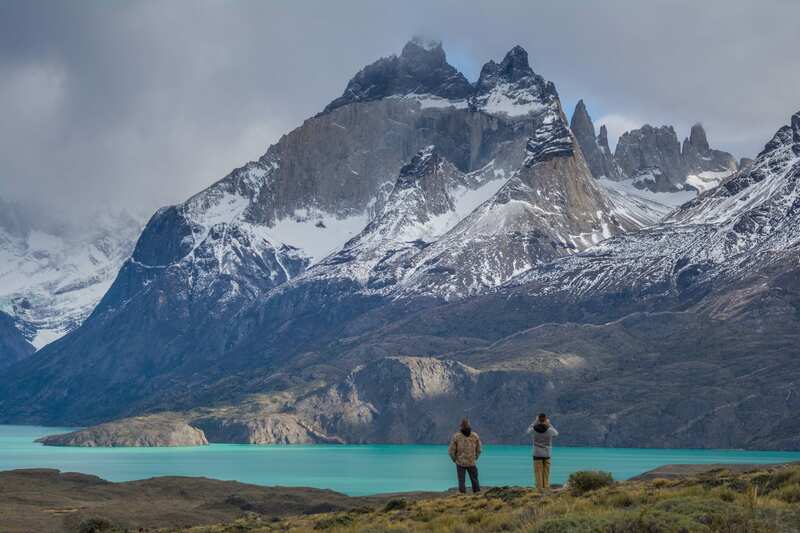 Experience the wild landscapes of the Chilean & Argentina regions of Patagonia on this amazing 11 day adventure to the most sought after locations. 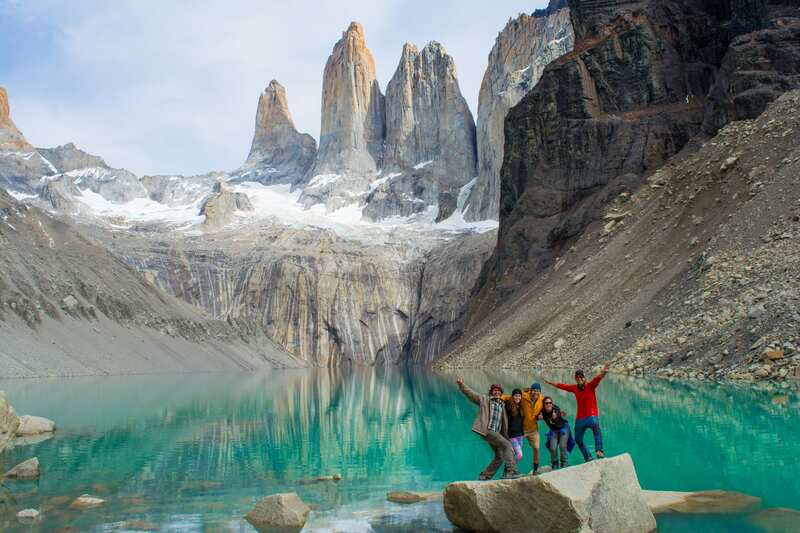 Trek through two of the most iconic National Parks - Los Glaciares & Torres del Paine. Public transportation from Puerto Natales to Torres del Paine National Park (Laguna Amarga Main Entrance), the trip is about two and a half hours (112 Km), with a short stop at Cerro Castillo Village. At the moment you arrive to Laguna Amarga entrance you will have to acquire your entrance ticket, and take the shuttles that will be waiting for you to take you to Las Torres sector (Estancia sector) where our Refugio is located. The first hour and a half walking is steep with fantastic views of lake Nordenskjöld and Almirante Nieto Mtn, with its hanging glaciers until you reach Refugio El Chileno to rest and leave your luggage. Then, carrying just a small back pack, you will continue the trail through a millenary Lenga forest (1 hour) until the base of “the moraine.” This challenging ascent of about 45 min, will take you to one of the most impressive lookouts in the park; “Base of Torres del Paine” where you will have the view of Torre Sur, Torre Central, Torre Norte and Cerro Nido de Cóndor. About 30 minutes after leaving Refugio El Chileno you will notice the sign to take the “shortcut” that leads to Refugio Los Cuernos. The trail goes through the Base of Almirante Nieto Mn. – part of the Paine Massif-, with great views to Nordenskjöld lake; from December the flora presents different colours specially the “Ciruelillo or Fire Bush” which take its name from the red colour of its flowers. After about 4 – 5 hours you will get to the Base of Los Cuernos where our Refugio is located, considered by many, one of the most charming sites in the whole park, a perfect spot to rest and recover energies for the next day challenging trek: “The French Valley”. The first 2 hours are with some ascents, descents and views to Nordenskjöld Lake until “Campamento Italiano”, at this point we recommend you to contact CONAF staff so you can leave your Big Backpack with them and start the next part of the trek with a small day backpack. 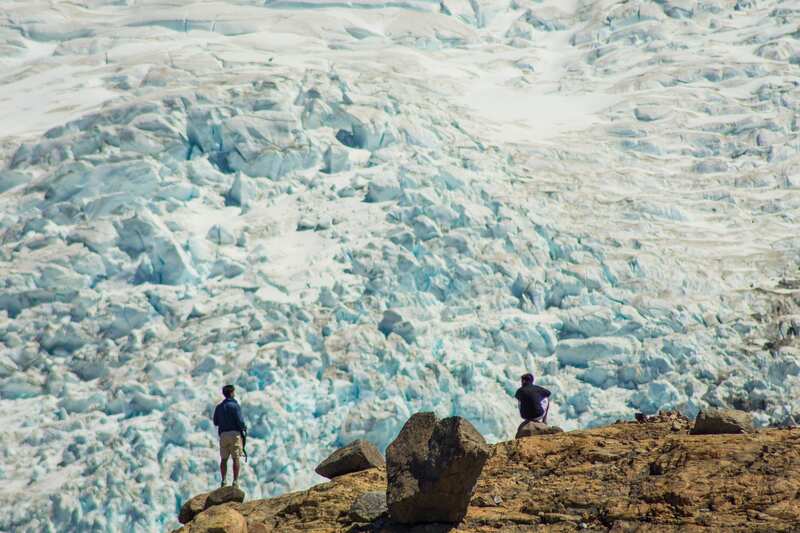 The ascent goes for about 1 hour and a half until French Glacier lookout, where you’ll be able to observe its hanging glacier and opportunities to observe small avalanches. After that the trail continues until “Británico area” and after about 20 minutes you will reach the lookout point considered by many as one of the most overwhelming spots in the Circuit: “Mirador Británico”, where you will admire: “Paine Grande”, “Cerro Hoja”, “Cerro Máscara”, “Cerro Catedral”, “Cerro Aleta de Tiburón”, “Cuerno Norte”, etc. The return is the same way back to “Campamento Italiano”, and then to Pehoé sector. Trek to Grey Glacier lookout (round-trip). The trail goes through the western side of the Paine Massif with views to Grey Lake and Mountains. 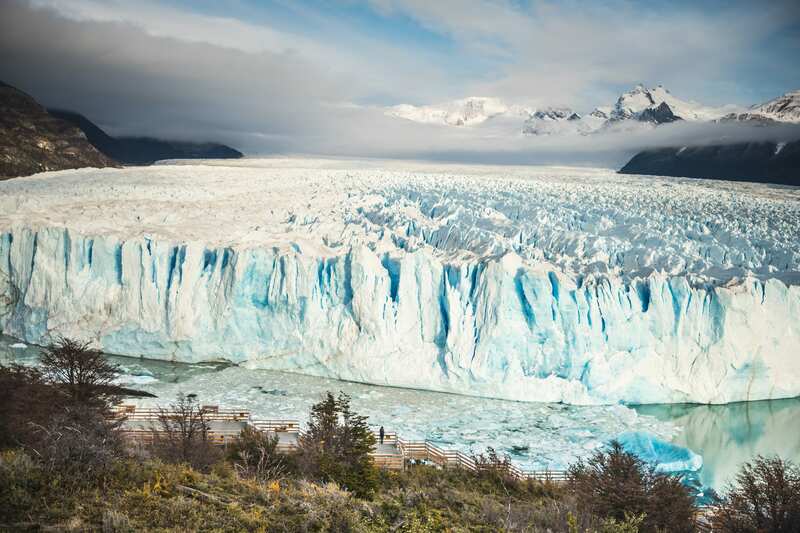 After 1 hour and a half you will reach the first lookout point, where you may observe Grey Glacier in the distance, then and after 1 and a half / two hours you will get to the Main lookout, in front of the glacier. 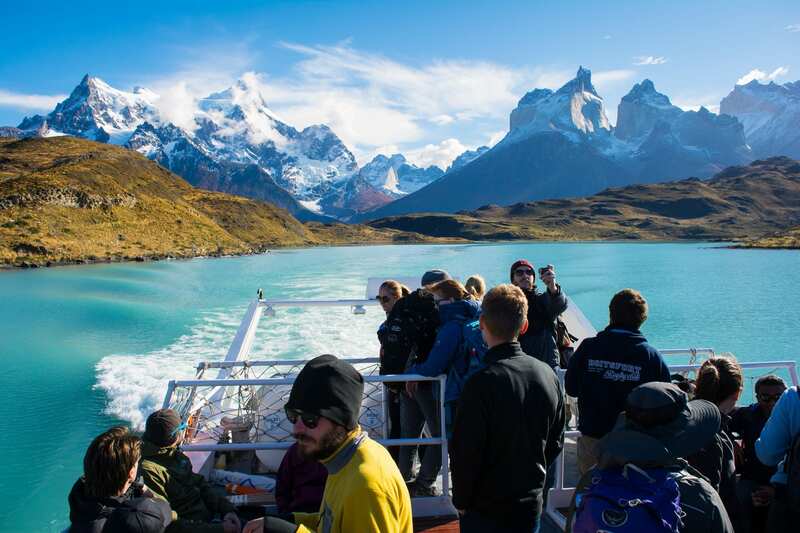 The return is the same way back until Pehoé Lake to take the Catamaran that crosses Pehoe Lake to Pudeto sector, where your bus will be waiting for you to take you back to Puerto Natales. Arriving around 10 or 11pm. Today get prepared to take your bus to El Calafate (shared service). To get to the bus station a taxi will cost you 6/8 dollars, roughly. We highly recommend being ready half hour before the departure time at the bus terminal. Once you arrive to the bus station at El Calafate you will be taken in private service to El Chalten (no guide). Not included: transportation to the bus station in Puerto Natales. You will be taken from El Calafate to El Chalten in private service, where for during about 3 hours you will be able to enjoy the desert of Southern Patagonia on the famous Route 40. You will pass through La Leona River, that connects Lake Argentino and Lake Viedma. By the river you will see La Leona Road House where once Butch Cassidy and Sundance Kid after robbing a bank where hidden for almost a month. Arrival in El Chalten in the afternoon, you will the rest of the day at leisure to relax or explore the areas around the town. You can explore the surroundings, have a stroll around a little waterfall, or just relax in the local brewery. 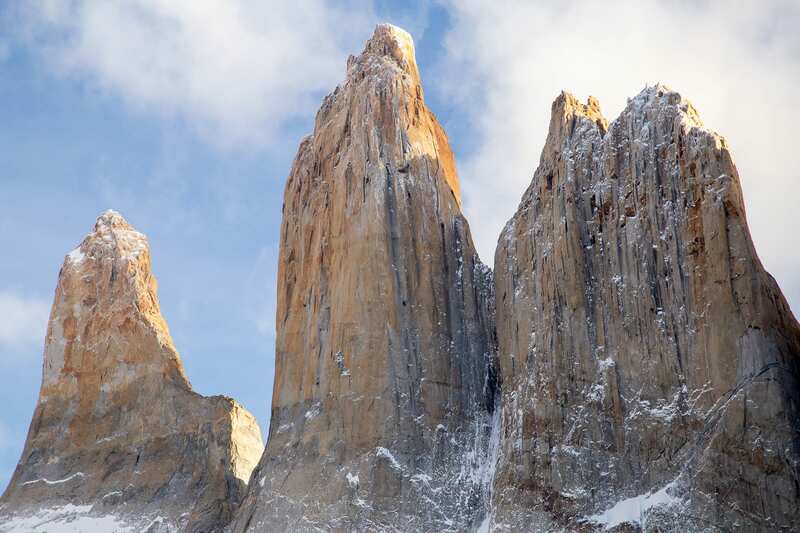 This natural viewpoint is the closest site to the imposing walls of the Fitz Roy and its peripheral granitic needles and without any doubt the most famous of all the walks. Duration: 5 hours (one way). Difficulty: medium / difficult. Slope: El Chaltén. Accessible: normally from October to May. Shared service with English speaking guide. 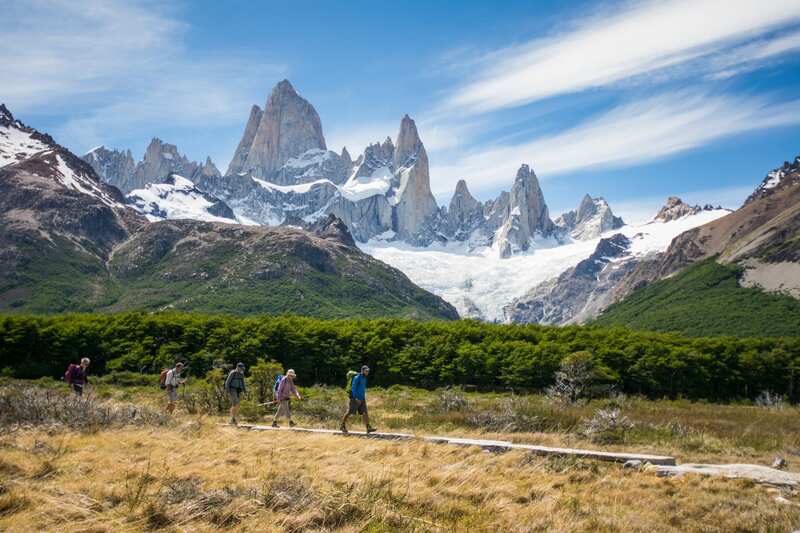 During the first hour of hiking, the slope is a bit steep, until entering the valley of the Del Salto stream towards Mount Fitz Roy. The ñires begin to be more and more numerous around the footpath and approximately an hour and a half of the journey you get to a well-signposted natural rocky viewpoint, with a sign that allows you to interpret the mountainous and glacier landscape that is presented in front of the traveler. The path continues always up the Del Salto stream to the drainage area of the Madre y Hija lagoons. About 4 hours after leaving from El Chaltén, you will arrive first at Poincenot Base Camp (one of the busiest National Park camping sites) and after crossing the Blanco River, to the Río Blanco base camp (only for climbers). From here the path continues with a steep slope of approximately 400 meters of height to the Tres lagoon, which will require more than an hour of effort. 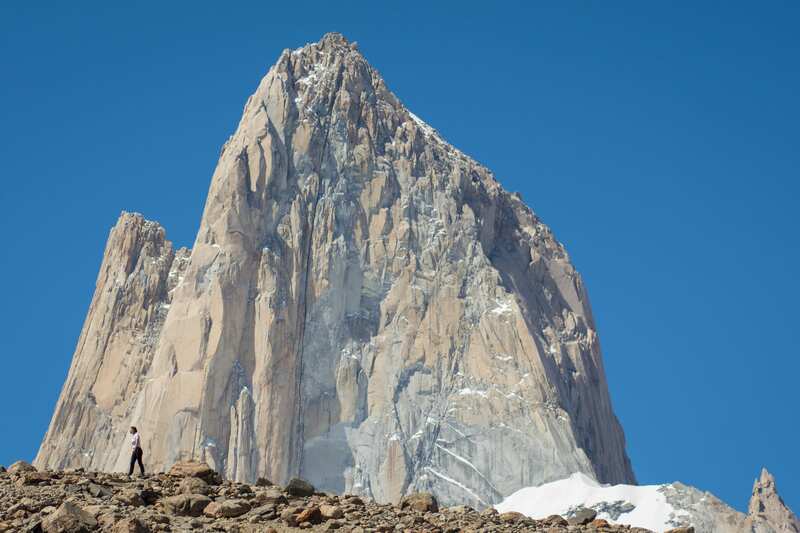 This is the closest view of the granitic wall of Mount Fitz Roy and its peripheral needles. 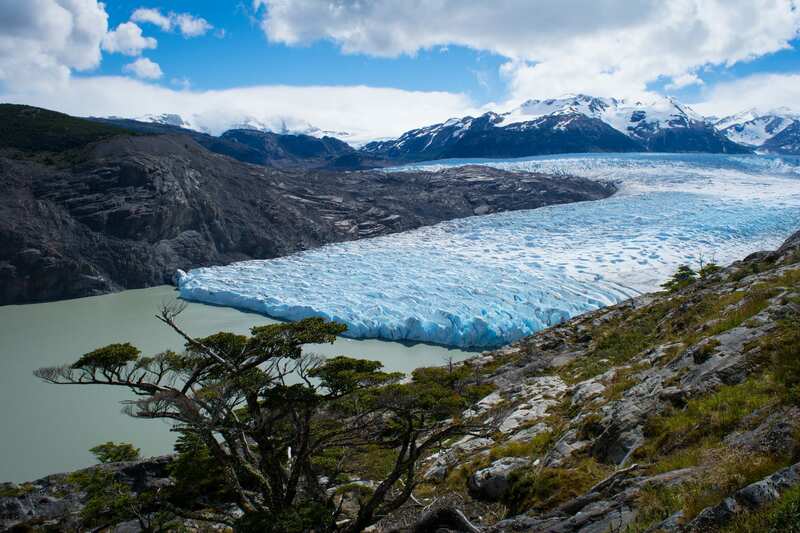 Going down, you can continue along a path that goes around the lagoon to its mouth, and at the end of the trail you can see the desolate Sucia lagoon and its hanging glaciers. Another fantastic trek is to access a 360° viewpoint via a less used trail in the national park. 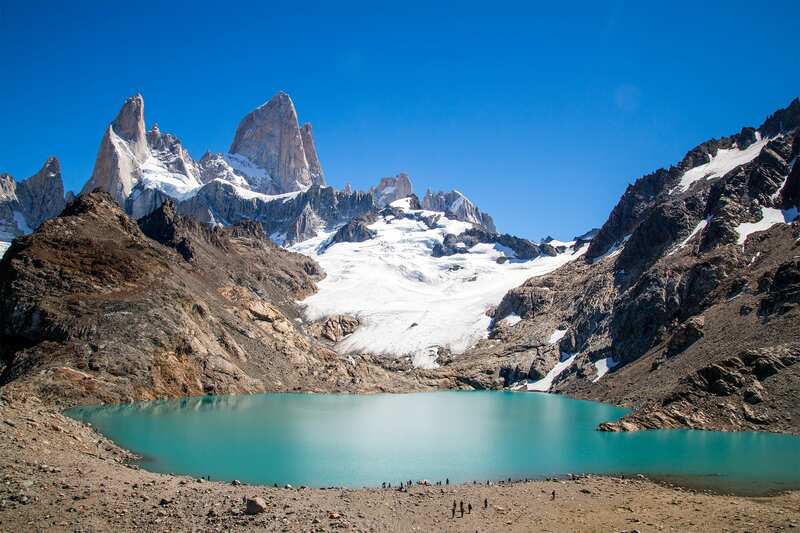 From here we can appreciate the valleys of Fitz Roy, Torre and Toro, the Patagonian steppe and the vast Lake Viedma. In the last stretch of the trail we will be walking in a completely different mountain terrain; where we can spot its typcial alpine flora, and if we can also search for marine fossils. We leave El Chaltén on the footpath that heads towards Laguna Toro. 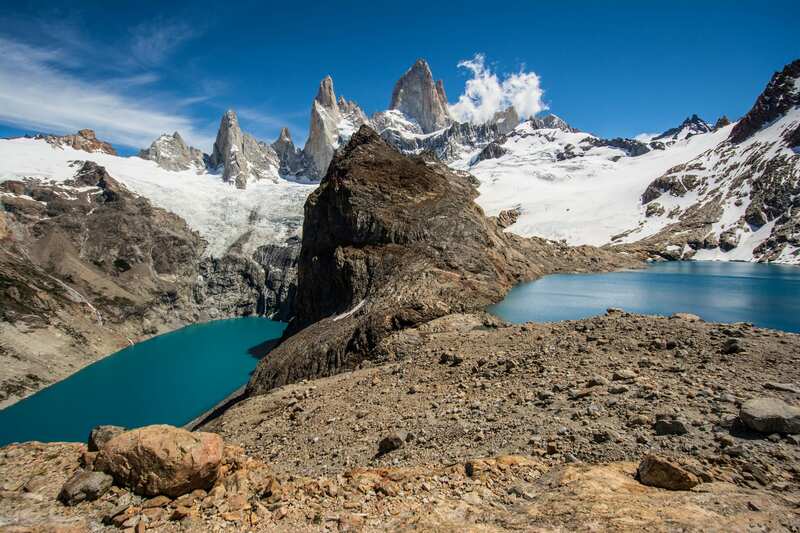 Having walked for about an hour in ascent and crossed over small streams and through some ñires and lengas woods, we arrive at an exposed area with a picture postcard view of Mount Fitz Roy, Torre and Huemul. We continue the hike across the Pampas, locally called “Pampa de las Carretas”. Then, we pass through various parts of the woods in which we will be able to hear a variety of birds, inviting us to discover and identify various species of birds that live here. On leaving the forest (about 1000masl) we start to walk across an alpine terrain, where delicate flowers growing in such an arid area won’t fail to surprise us. It can snow up here, even in the summer! In this section it is quite possible to find the remains of marine fossils such as ammonites and belemnites which are about 100 million years old. In this last section we can also experience the Patagonian wind, which is just as much part of the trek!. We finally arrive at the viewpoint - nearly at 1500 masl. 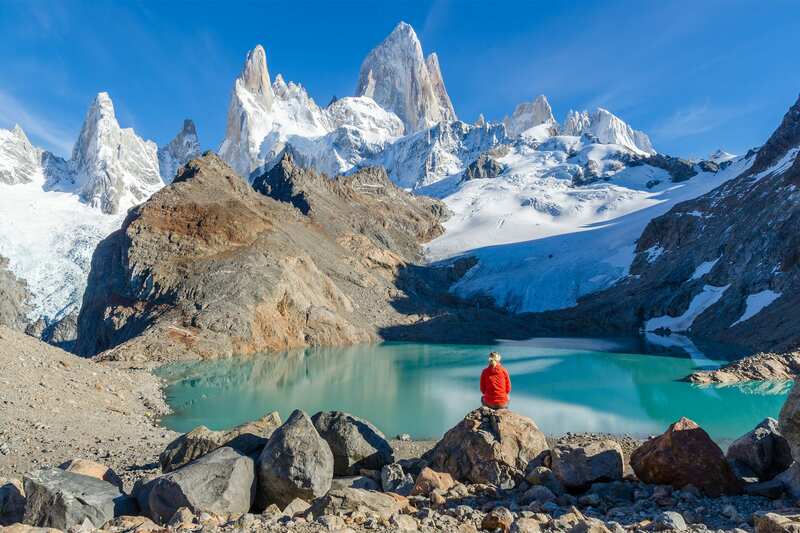 This spot offers an unconventional and unique view of the Torre and Fitz Roy massifs. Return to El Chaltén. Bear in mind that in the afternoon you will board your bus back to El Calafate (shared service). It will pass by your hotel to pick you up, so you need to be back in time.The 3 hour-long driving back will be a good opportunity to rest or just relax enjoying the the passing landscape at your window. Once you arrive at El Calafate, the bus will leave you at your hotel. You can take a brief walk to see downtown and enjoy a typical Patagonian appetizer in one of the local bars. What to bring: Sunglasses / sunblock / gloves / hat / raincoat / hiking boots / small backpack. Note: excursion allowed only for passengers from 10 years old to 65 years old. No exceptions. Not allowed for pregnant women, overweight people or any type of disability. National Park Los Glaciares entrance included. This unforgettable experience begins very early in the morning, at “Bajo de las Sombras” Port, after visiting the Glacier’s catwalks. Once on-board, participants cross the Rico Branch, and after 10 minutes they disembark on the west coast. From this point, the mountain guides lead the group even closer to the glacier to take the crampons and start the approximation crossing. 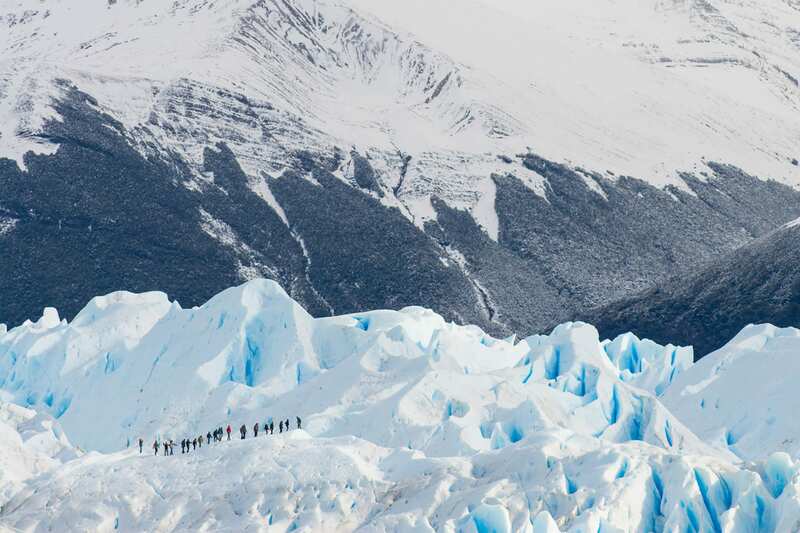 The path runs along the southern moraine of Perito Moreno glacier, and after an hour participants find a spectacular viewpoint, from where they will have access to the ice. Once over the glacier and with the crampons already put on, the world takes a new perspective: blue lagoons, deep crevasses, huge sinks, magical caves and the unique feeling of being in the centre of the glacier. Participants will always be accompanied by expert trained guides. 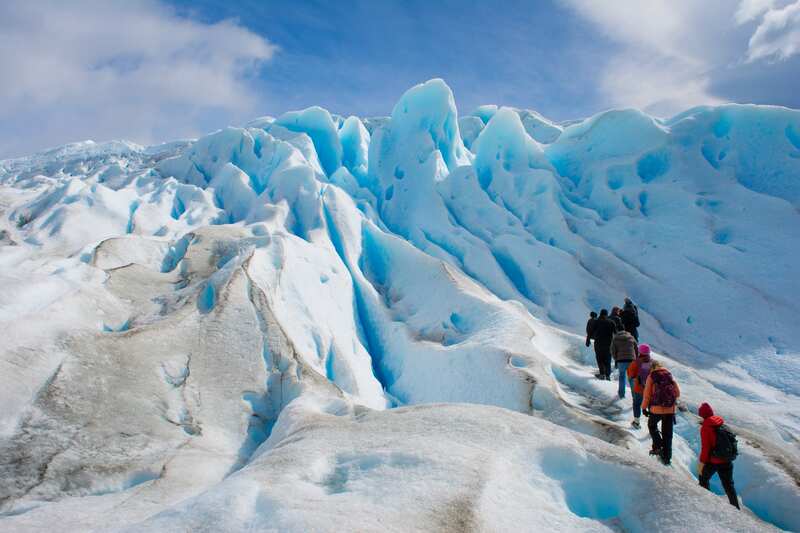 During three hours and a half every corner of the most special glacier of the world is explored, while the guides invite to learn more about the ice and its environment. Over a selected spot of this immense white blanket , a place of unparalleled beauty, participants will have 30 minutes for lunch (picnic is NOT INCLUDED). Once back on the moraine, and after another hour of walking, the boat back to “civilization” is taken, after having enjoyed one of the most spectacular ice trekking in the world. Today we’ll take you to the airport to take your flight (shared service). 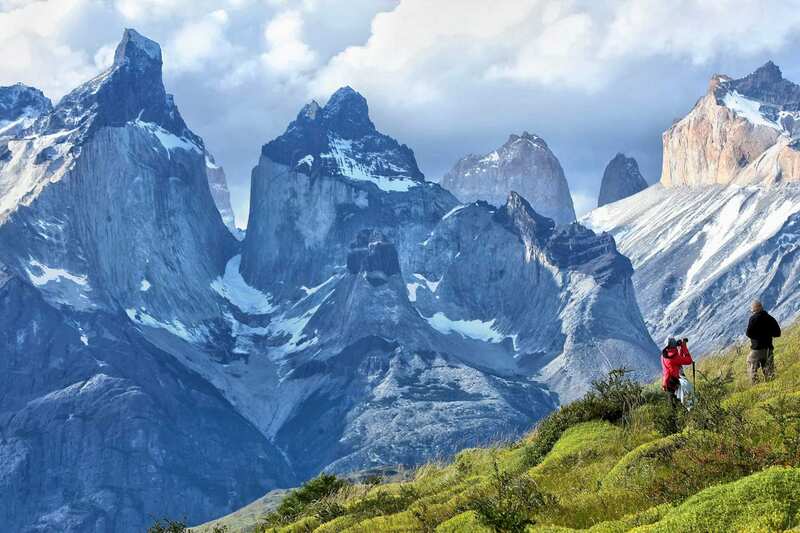 Your Patagonian trip is about to end…or maybe not? 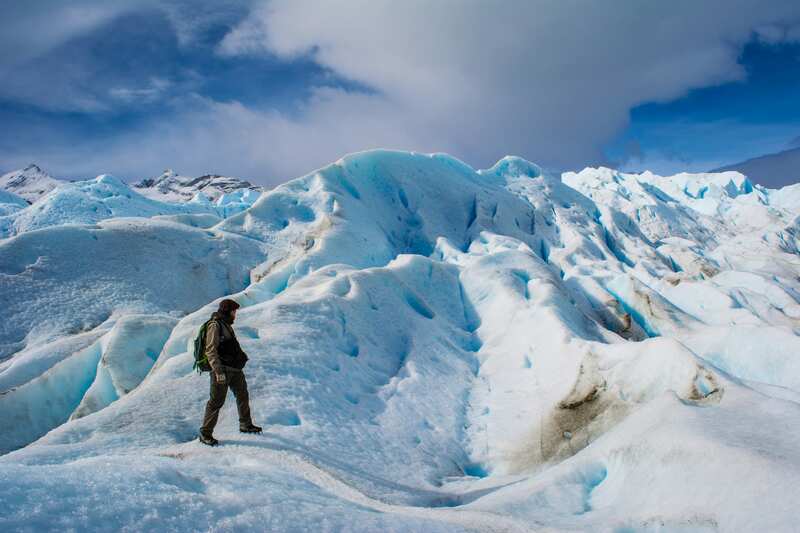 If you want you can extend your trip to keep on exploring Patagonia, we’ll be glad to help you design your next adventure. Transportation on a regular bus from Puerto Natales to Torres del Paine National Park and back. 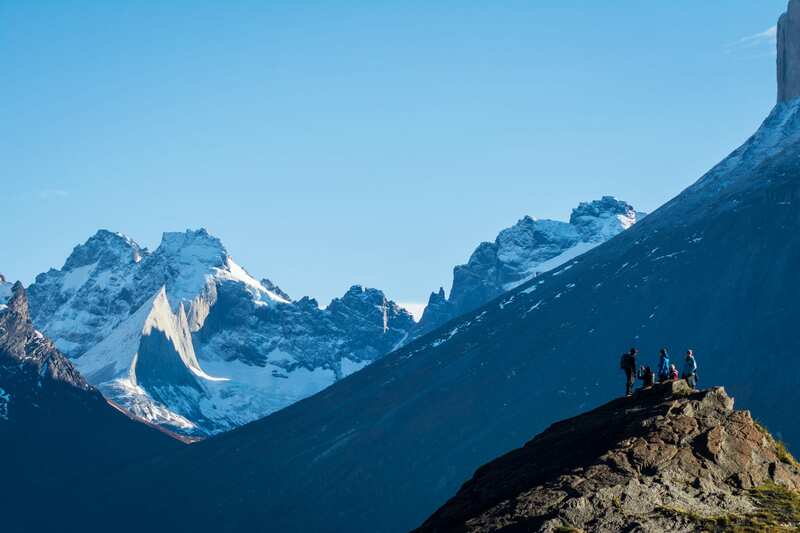 2 nights of lodging at Torre Central Sector, 1 night at the Francés Sector, and 1 night at the Paine Grande Sector. Mountain refuges include fully-made beds, except at the Francés Mountain Refuge (sleeping bag). Campsite includes tent, sleeping bag, sleeping pad, and liner. 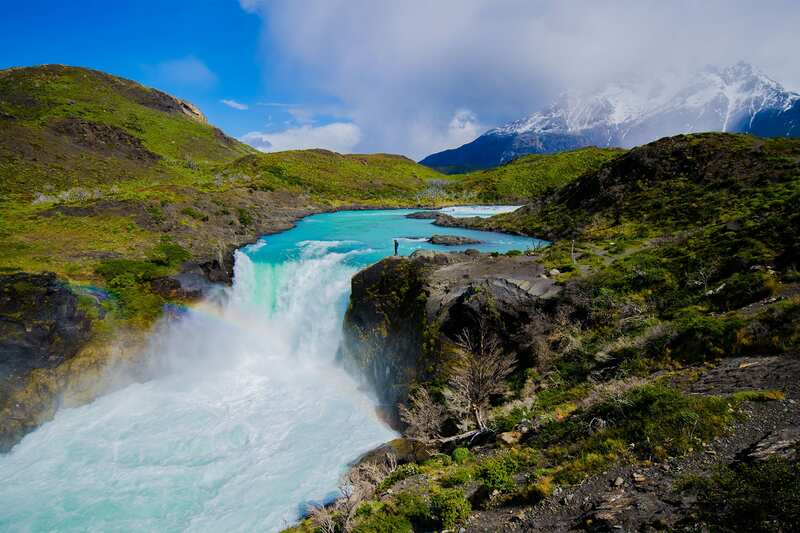 Torres del Paine National Park entrance fees. * Subject to change based on available itinerary.